“Forced water landing,” not a crash. “Everything is unprecedented until it happens for the first time.” Tell him, Sully. “Porterhouse will stop your heart.” Ha! Airplane safety instructions...the one time people need to be paying attention. “Brace, brace, brace. Heads down, stay down.” Words you never want to hear. “People don’t survive water landings.” Wrong. “I had to land in the Hudson.” Sully says it like it’s an everyday occurrence. 155. The number Sully was hoping to hear. “A delay is better than a disaster.” Timely #FortuneCookie message. “You’ve taken all of the humanity out of the cockpit.” You got ‘em there, Sully. “Does anyone need to see more simulations?” Yes! “We did our job.” Yes you did, Sully. And you saved everyone’s life. “I would have done it in July.” Ha! Final analysis: a powerful testament to human ingenuity and courage. Rating: 3 1/2 out of 4 stars. Peerless acting and directing in this incredible true story of uncommon heroism. In the hands of less skilled artisans, this film could’ve been a methodical, mediocre mess. By artisans, of course, I’m referring to the dedicated cast and crew of Sully, along with the dream team of director Clint Eastwood and actor Tom Hanks in their first cinematic collaboration. Having helmed Changeling (2008), Invictus (2009), J. Edgar (2011) and Jersey Boys (2014), Eastwood is no stranger to films based on true stories. Whereas his style in the past was marked by a formal stiffness, his direction here is steady and fluid, like a jet cruising at 30,000 feet. It would be unfair to label Eastwood’s earlier directorial efforts as boring, but other, more euphemistic words could certainly be employed, like: conservative, deliberate and restrained. In this film, purposeful pacing has been replaced with a sense of urgency rarely witnessed in an Eastwood picture, a change in style necessitated by the story itself—a pseudo-disaster movie mixed with a docu-drama with a twist of a legal procedural. Much like the subject matter itself, Eastwood’s direction is taut, terse and sufficiently streamlined…the film’s running time is a lean 96 minutes. Amid plane safety checks, aviation emergency procedures, media oversaturation and review board regulations, Eastwood keeps his finger firmly on the pulse and purpose of the film—the 155 lives that were saved by the instinctual, heroic actions of an experienced airplane pilot. It’s to his credit that Eastwood never loses sight of the human factor while regaling the terrifying events from the headline-dominating story from January 15, 2009. This is as complete a film as Eastwood has delivered and, as such, should garner attention from Academy voters, something he’s failed to seize since winning Best Director and Best Picture Oscars for Million Dollar Baby in 2004. Eastwood has always tapped top tier talent for his films and actors don’t come any more highly sought-after than Hanks. As would be expected, there isn’t a single false note in Hanks’ brilliantly multilayered and underplayed portrayal of Captain Chesley “Sully” Sullenberger. From his reactions during the actual plane crash (as well as the PTSD fantasy of a plane colliding with a NYC building), to interactions with his screen wife (Laura Linney), co-pilot (Aaron Eckhart), members of the media (including Katie Couric in a choice cameo) as well as the board of inquiry (Mike O’Malley, Jamey Sheridan and Anna Gunn), Hanks is simply masterful here, effortlessly conveying Sully’s dignity and sagacity. One look at Hanks in the captain’s uniform and it’s clear that he was born to play an airplane pilot…and just as with his costume, the role was tailor-made for him. Will this superlative effort generate another Oscar nod for Hanks? Also worthy of Oscar consideration is Eckhart, who plays co-pilot Jeff Skiles. Though it isn’t a colorful, edgy or overly nuanced part, Eckhart perfectly captures Skiles’ unwavering loyalty to Sully in an expertly measured performance. Ultimately what helps this movie achieve liftoff is the harmonic prosody between writer Todd Komarnicki and the editing team. Komarnicki’s screenplay is based on the book Highest Duty, written by Sullenberger and Jeffrey Zaslow. If told in a straightforward manner, this story would’ve never left the tarmac. Komarnicki’s effective use of wistful memories back to Sully’s early days as a pilot (a la 1957’s The Spirit of St. Louis), dream and daydream sequences and non-linear plotting all prevent this film from becoming a prototypical biopic. Likewise, the way Komarnicki breaks up the procedural portion of the film with character sidebars, video simulations and flashbacks is also flawlessly executed. Unlike the balance of the action, which is dominated by weighty life-and-death matters, the film ends on a humorous note—another indication that Eastwood has finally learned how to loosen up in his dotage. All in all, this is a first-rate true story adaptation that soars despite being grounded for most of the film. 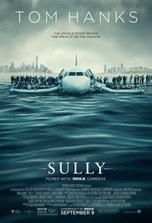 Be sure to stay through the end credits for clips of the real Sully along with the crew and passengers from US Airways Flight 1549. Tissues required. By some strange coincidence, Hanks’ career has been punctuated by plane crashes and water landings: his characters have survived two plane crashes in Cast Away (2000) and Sully and three water landings including those two films along with Apollo 13 (1995). Additionally, many of Hanks’ films have centered on similar settings and situations, including: a whole other kind of water landing in Saving Private Ryan (1998), the stranded in an airport character study in The Terminal (2004), a boy coping with his dad’s death in the 9/11 plane attacks in Extremely Loud & Incredibly Close (2011) and terror on the high seas as a cargo ship is besieged by pirates in Captain Phillips (2013). Incidentally, Hanks played a courageous captain in that true story too.